Bike&Co 25th Anniversary in Rheda/Germany (27./28.1.2018). Basil will set the tone and trends for the new cycling season with new designs and stylish product lines.Whether it’s enjoying a pleasant cycle to the market or a refreshing ride home after a long day’s work, Basil’s mission is to encourage everyone to hop on a bike more often. 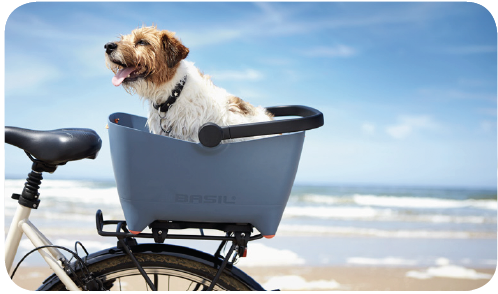 And now it doesn’t matter if you’re alone, with the love of your life, or just jumping on your bike with your dog, Basil expect to make even more people happy with their new collection of bags, baskets and bicycle accessories. Basil Buddy – take your best friend along too! With a Basil Buddy, Lassie, Bram, Coco or any other four-legged friend can now go wherever you go. This unique dog basket made from environmentally friendly polypropylene (PP) is safe, easy-to clean, and totally dog-friendly. Just stow your dog and go! can be used with, or without, the protective wire cage. Luxurious, romantic and deliciously curvy, the new Basil Magnolia collection simply exudes feminine charm. There are pastel powders or poppy reds to match your style and mood – loud or tastefully restrained, and whether you want to ride in the rain, or not. The collection includes a Shopper, a Double Bag, a Carry All Bag and a City Bag. Choose your fl ower print design available in the following colours: poppy red, teal blue, pastel powders and blackberry. The Basil Noir series is perfect for fashion-conscious women who enjoy the effervescent city life. Should they get caught in the rain, no worries. The Basil Noir bags meet the high IPX3 standard, so ‘waterproof’ is genuinely a watertight promise. In addition to the bags (Business bag and City bag) there are also black bicycle seat covers and a black wicker-look basket. The Urban Dry series is where style and function meet in sublime fashion. The business bag, the shopper and the double bag from this series are waterproof, so your expensive laptop and smartphone stay bone-dry during a downpour. The bags are finished with Vega leather-look edging and can be attached to your bike in seconds. Made for people who go for the sheer enjoyment of cycling, maybe on a cycling holiday or a relaxed ride on a Sunday afternoon. The bags have no visible seams and are waterproof in accordance with the high IPX3 standard. Not a drop of water will get to the contents of the bag. feature smart and safe details: reflective components and eyes for attaching LED lights. But there is even more! MIK is a revolutionary interface system that allows you to mount accessories onto the rear (luggage) carrier rack. The new system developed by Basil and Massload provides a great diversity for all involved: cyclists, retailers, manufacturers and wholesalers. MIK has been designed as a cross-brand compatibility open platform with a very intuitive way of attaching to the rear (luggage) carrier rack. Because of MIK bicycle accessories can be exchanged in the blink of an eye. The piece de resistance is the fact that (bicycle) manufacturers are free in their design of rear (luggage) carrier racks and will have the ability to choose from multiple MIK extrusion profiles. To develop an interface system for bicycle accessories that will radically change the market nowadays and will become a worldwide standard: that has been the goal when MIK (Mounting Is Key) was developed. MIK originates from a collaboration between bicycle accessories manufacturer Basil and luggage carrier manufacturer Massload. MIK will be a separate brand and company. MIK offers cyclist, retailers, manufacturers and wholesalers with a great variety of options. As MIK has been designed to work as an open platform it is compatible with bicycle accessories of all different brand of bicycle accessories. Cyclist are able to change their bicycle accessories (from bicycle bag to basket to trunkbag) in seconds. Bicycle bag, bicycle basket, dog basket: it only takes a second to click them onto the MIK rear carrier rack. For retailers the cross-brand compatability offers lots of opportunities. Thanks to the integrated key the bicycle accessories are protected against the occasional theft and therefore suitable for leasing. For bicycle manufacturers MIK is “open”: they have the freedom to design rear carrier racks to their own liking. Because of the fact that bicycle manufacturers are given the choice of multiple MIK extrusion profiles the esthetic look of the bicycles will be improved: a “clean and integrated look” will be the result. March 2017 saw the soft launch of the MIK-system in Taipei. Topbrands such as Ghost and Riese & Müller have decided to integrate the MIK-system in their carrier racks. The first bicycles with MIK-extrusion profiles will be available in 2018 – a year sooner as planned. MIK also provides aftermarket solutions. By means of the MIK carrier plate virtually all rear carrier racks are compatible with MIK accessories. Basil has 31 MIK compatible products in the 2018 collection. The German bicycle accessories manufacturer Haberland will launch a number MIK compatible products onto the market. Within short term notice the names of renown bicycle accessories manufacturers will be announced that will produce MIK compatible products. Experience the Basil effect at the coming exhibitions! Tips for a delicious Easter!